This sings Summer does it not? Crisp, fresh salads and maybe some serious meats are on the menu all Summer long. Every year it starts and ends the same. Many salads, and many grilled vegetables and meats. This Summer is no different. Although it started with a trip to Mexico that inspired me in so many ways. This is another inspiration from our trip to the Yucatan. 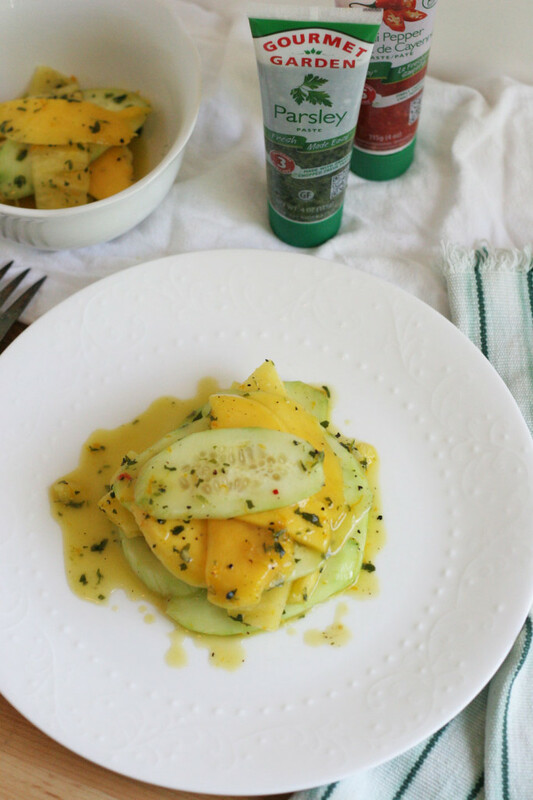 Cucumber, mango, and pineapple salad with the best savory and sweet dressing to compliment and brighten up the wonderful fruits. 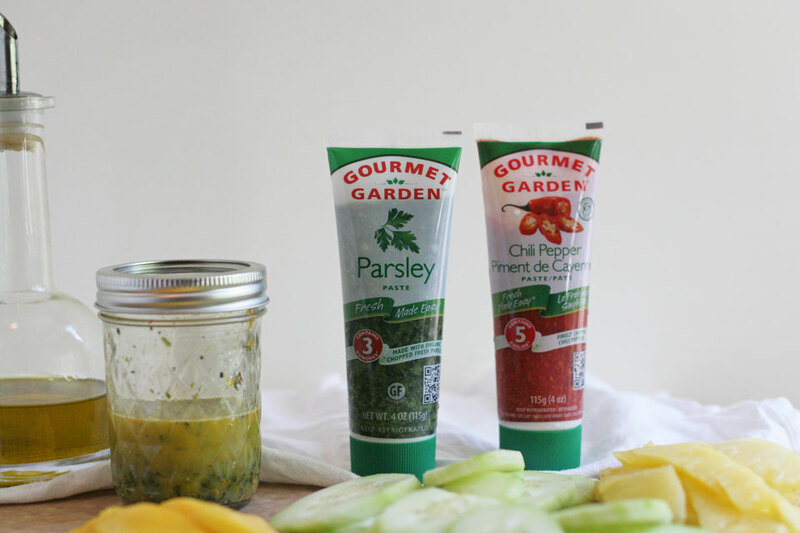 I used a wonderful organic product for the savory herb dressing from Gourmet Garden, and pepped it up with some of their chiles as well. I think you’ll love it! I am happy to introduce a new relationship that has been in the works for some time for Not Just Baked. 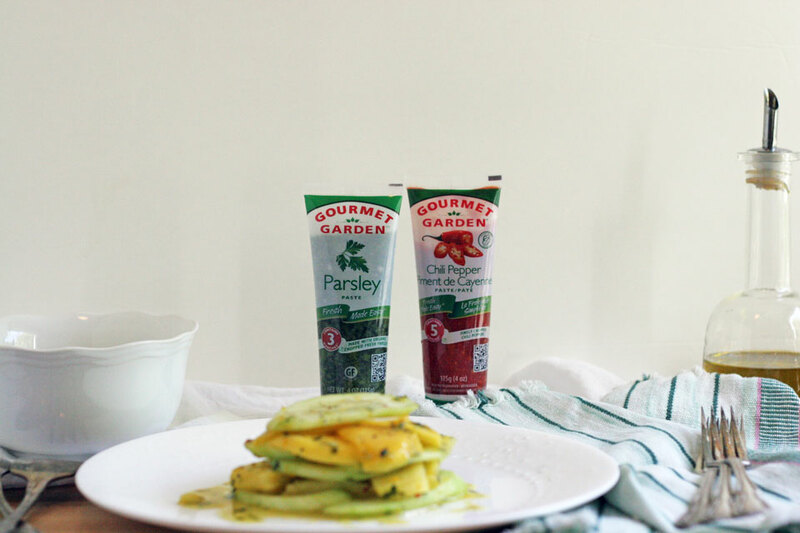 I welcome, Gourmet Garden, to the NJB site. I will be sharing monthly recipes using their products. They have a variety of products that are super convenient, high quality, and organic. I cannot wait to share with you in the months to come. Today this is the first recipe I have developed for the company, and I am very excited it was inspired by my trip! I spiced this salad up with the chili peppers, and you can put as much or as little as you would like. Also, if you’re not into spice, just omit it completely. I just like a little kick from the chiles. 1. 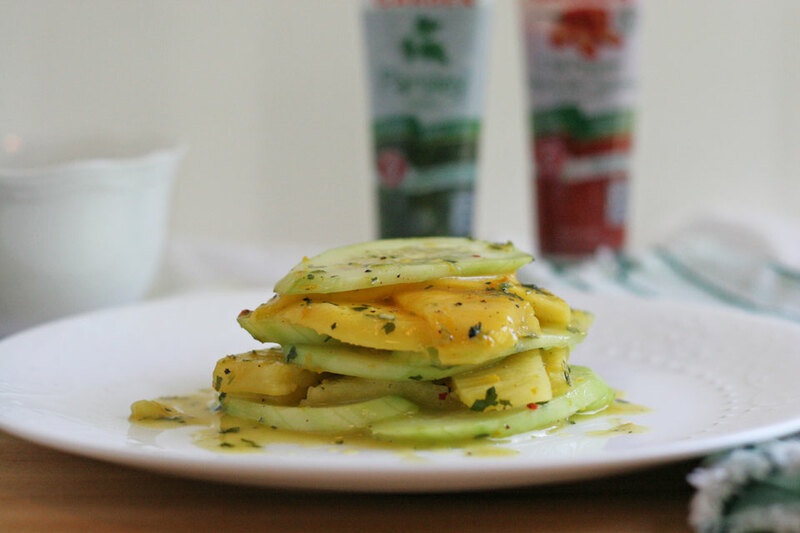 In large bowl add the cucumber, mango, and pineapple. Toss to combine. In a small jar add the orange juice, olive oil, parley paste, salt, pepper, chili if using, place a lid on tightly, shake to combine. 2. Add the dressing to the fruit, and toss to combine. Place in fridge to allow to chill for about an hour. Taste for seasoning Serve cold. Store in an airtight container for up to 3 days. Disclosure: This post is sponsored by Gourmet Garden, and I was compensated for this post. As usual, all opinions are my own.